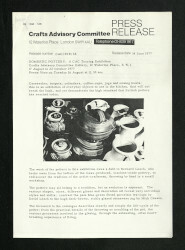 List dated 16 November 1977 showing indicative retail prices for work included in the Crafts Advisory Committee's touring exhibition 'Domestic Pottery'. 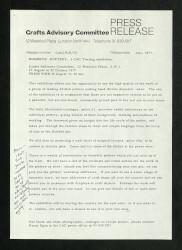 The document lists the names of the makers represented in the exhibition alongside an approximate retail price range for their work. A sticker attached to the top left corner indicates the library reference number. There is also a barcoded sticker attached to the reverse.